Robin will be in the Tasting Kitchen offering samples of her delicious gluten free muffins. Pass the Lactose-free Milk Replacement! 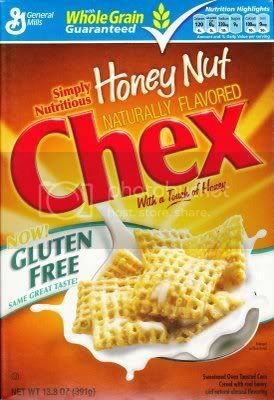 I spoke with General Mills customer service today to confirm that Corn Chex, Cinnamon Chex, Strawberry Chex, and Honey Nut Chex have also been re-formulated to be gluten-free. The General Mills representative said that if any of their cereals are gluten-free it will be clearly marked on the front and side of the box and that some cereals may be rolled out in only some parts of the country at first. UPDATE: Gluten-free versions of Chex will officially be available on June 1st. Thanks to The Gluten-Free Homemaker for this detail! I’m really excited to try the other GF flavors when they hit the stores! I think when I went GF 2 1/2 years ago, there was just Rice, Corn, and Wheat Chex. They also had a Frosted Mini Chex, which was really good…but, alas…I degress. Other General Mills cereals that are GF-friendly include Honey Kix and Chocolate Lucky Charms. I’ve been eating Trix on occasion, but I didn’t know about these others. Way to Go, General Mills! The Gluten-free Community applauds you! The Orange Valencia Cake is a delicious moist citrus cake bursting with Valencia oranges and topped with crunchy almonds. Not only is it gluten-free, it is also prepared with 7 simple ingredients: Whole Eggs, Valencia Orange Pulp, Almonds, Sugar, Orange Peel, Gluten Free Baking Powder, and Orange Oil. Plus it delivers 30% of your daily value of vitamin C.
Keep on the look out for it in the pastry case with a sign that says “gluten-free.” A single cake will be displayed unwrapped so you can see it clearly, but don’t worry. They all come individually packaged to prevent cross contamination. 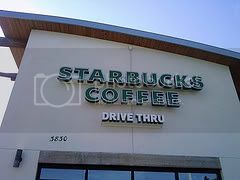 Way to Go Starbucks for listening to your customers and being sensitive to the needs of your gluten-free fans! Forest Hills Foods will be holding another Gluten-free tasting event on May 1. Marion with Pamela’s gluten free bakery will be here baking gluten free cornbread and gluten free brownies! Time: 4-5 pm. Forest Hills Foods will be holding another Gluten-Free tasting day on Monday, March 10 from 12:00-7:00 pm. Enjoy! We’re thinking about taking a road trip over to Trader Joes…if you’re interested, drop me a line & we’ll figure out the details. Join us on Saturday, February 16 from 10 am – 3 pm for our 1st Gluten-Free Fair at the Hudsonville Harvest Health Location. We will sample a wide variety of Gluten-Free products, vendors will be on hand to talk about their products and we will feature Special One Day Pricing on certain Gluten-Free Products! Customer drawings for baskets of G/F products. Bring your favorite – tried and true – Gluten-Free recipe to share or email it to Info@HarvestHealthFoods.com. I just ran across a new site that has some gluten-free baking mixes and thought you might be interested. Cara’s Cafe has coffees, teas, and cocoas in addition to her gluten-free and/or sugar-free baking mixes. Another source for us! Yippee! Monday November 5 Forest Hills Foods is dedicating another day to gluten free products. Thanks to helpful input from visitors in September they now carry the Cherrybrook Kitchen cakes and cookie mixes. Coco Charlotte Bakery is now making Anna’s Bread in her bakery and offering them for sale at her facility and at Forest Hills Foods. They also have the Lundeberg’s gluten free snacks and corn pastas. This event is open house style from 12:00 PM to 7:00 PM.